Link: Dancing with Dogs: This is too sad. Penury has driven a woman powerlifter from Orissa to sell all the medals she has won in national and international meets. I don't understand why are we obligated to support a sport that we don't care about. Does anyone think that the Indian people will gather in millions to watch a weight lighting competition? Just because somebody has a talent doesn't mean others are obligated to appreciate it. Western countries are rich and government has plenty of tax-payers money to waste on developing talents that only a few care about. But I am sorry, we can't afford to do the same. Instead of lamenting the fate of such athlets maybe we should stop sending them to the Olympics, the Asiad and other International competitions and save some more of the tax-payer's money. Markets can take care of supporting sportpersons if there are enough interested "customers" to watch them and get entertained. There is no need for the government or the elites to tell us what we ought to be interested in or not. And there is also no need to engage our pride in the International sports competitions. 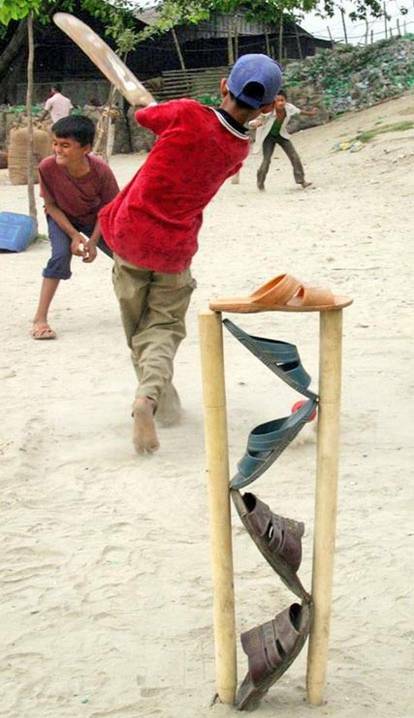 A friend of mine sent me this image that captures the love for cricket and creativity.